Have you ever wondered why it is that a single master key can open any of the locks in your entire apartment complex, while the one you have will only open your apartment door, and possibly the main entrance door to the building? While this specific scenario highlights a master key setup in an apartment complex, the same situation could be true with any number of other commercial and residential lock-and-key configurations. 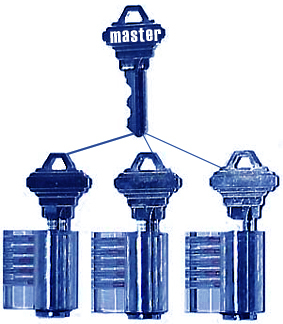 The answer to the ‘one key, many locks’ question lies in a very clever arrangement of the components which comprise a lock and key system – but the same principle which allows that kind of master key access is also what makes this model vulnerable to a security breach, if engineered by a skillful and knowledgeable criminal. Here’s why all that is true. Most locks are constructed using design concepts which are fairly uniform in the industry, the most common of which is the cylinder lock. With this kind of design, the key turns a cylinder which is attached to a cam, which then also gets turned. When the cylinder is turned in one direction, the cam or plug, causes the door to open by pulling in on the bolt. When the cylinder is turned in the opposite direction, the bolt is released by the cam and is snapped into place to prevent the door from opening. Another common type of lock is the pin and tumbler design, which features a series of small pins, each having different lengths. These pins are separated into pairs, with each pair situated in a shaft that goes through the central cylinder cam, and on into the housing. The pairs of pins are kept in position by springs situated at the top of the shafts. Before key insertion, the bottom end of each pair rests totally inside the plug, and the topside pin stays halfway inside the plug and halfway within the housing. The position of the upper pin is what prevents the plug from being turned, because the plug is bound to the housing by the pins. The fundamental principle which makes any master key system functional is that there are extra pins in the cylinder of the lock, and these allow for several differently shaped keys to achieve a compatible alignment with all sets of pins that they extend into. If you need a master key system to be installed at your home or place of business, the first call you should make is to a highly reputable commercial locksmith or residential locksmith in your area. As mentioned earlier, some master key systems are more easily breached than others, because clever criminals can reverse engineer the system of pins in the cylinder to create their own master key. An expert locksmith can discourage this kind of criminal breach of security with a professionally designed master key system.